Its breast cancer charity isn’t in the hot seat, but are Avon’s walks about finding a cure or selling lipstick? The 39-mile, two-day walk is the Avon Foundation’s most high-profile charity event. In 2010 nearly 22,000 participants took part in one of nine walks and raised more than $55 million. It’s of a piece with Komen’s big event, the Susan G. Komen for the Cure event, a 3-day, 60-mile walk that takes place in 14 cities around the country. Though it’s true Komen and Avon aren’t connected, there are plenty of reasons to be skeptical about Avon’s Walk for Breast Cancer. AFW claims that their walk increases visibility for the disease and builds solidarity among survivors and their loved ones, but these fundraisers also do a great deal to boost the public image of a cosmetics company best known for its door-to-door saleswomen. According to a 2010 report at Charity Watch (formerly known as American Institute of Philanthropy) titled “Avon Raises Awareness for Its Cosmetics and for Breast Cancer,” in 2008 the organization spent $39 in order to raise each $100 it pulled in. This was inefficient enough to earn a C+ rating from the website. More concerning still are the charity’s ties to a for-profit corporation. While Avon Foundation for Women claims it has no employees, an arrangement that would presumably save the organization a good deal on salaries, Charity Watch learned that they do spend money on what’s described as an “administrative services arrangement” where Avon the charity reimburses Avon the cosmetics corp. for things like management expenses and operations. These costs could account for a portion of the $7.6 million that Avon Foundation paid for “other fees for services” in 2008, but the ways things are, we can’t know for sure. Additionally, according to its 2010 financial statements, the corporation provided the foundation with $1.6 million for staffing. “By using Avon employees for its staffing needs and reimbursing the company for these related costs in lump sums, this arrangement allows APF [Avon Product Foundation] to not provide breakouts of what it is compensating each person for their services to the charity,” says Charity Watch, which tried to get the organization to provide information on the costs and revenue of its walks, but wasn’t given access to those numbers. We do know that the foundation spent over $45 million dollars last year on its “Breast Cancer Crusade”, $35 million of which went to grants for research, patient care, and outreach and education. I struggled to figure out how much was raised by the walks in a particular year; however, the Avon Walk for Breast Cancer FAQ claims $423 million has been raised from 2003–2011. 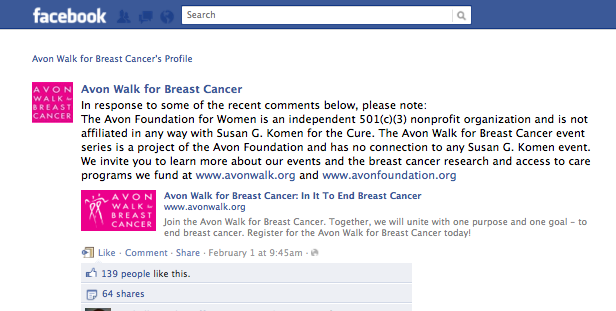 Okay, so Avon’s finances are murky, but the breast cancer walk still sounds like a pretty good time. It also sounds expensive. For the participants able to raise the $1,800 minimum, the organization offers fundraising guidance and trainings. An article by Anne Kadet in Smart Money describes how during the course of the walk Avon shells out for snacks and bathrooms at rest stops, and a night in the “Wellness Village” complete with yoga, massages, and entertainment. What Would It Take to Trust Komen Again? What Does Komen’s Latest Statement on Planned Parenthood Really Mean?